1. Ideology has been my field of focus for the last 15 years, and I came to understand Islamism as both the most dangerous threatening humanity today, and also one capable of being defeated. It began as an eccentric hobby and then evolved into a profession: I wanted to understand the differences between the factions on the Left and the Right to figure out whose ideology was actually the best. To that end I've gone across the whole spectrum from 2001 until last year when I retired from politics to begin focusing more on culture, faith, and family. From the radical Left through the progressive Democrat Left to the neo-liberal Left to the corporatist Center to the neoconservative Fox News center-right out to the grassroots Tea Party conservative activist Right and even bumping into some on the Far Right – I've fought for and against most of the ideologies in American politics. I've sought to understand ideological movements both by studying them and participating. And now the one most worthy of attention is Islamism. 2. I came to agree with MEF President Dr. Daniel Pipes's history-centered approach for understanding the distinction between Islamism and Islam. Some of IW's readers may know me from the previous publications where I've edited and written – FrontPageMag, NewsReal Blog, and PJ Media. In particular, my experiences at this last site, working with Barry Rubin, PJ's Middle East Editor who passed away in February 2014, deeply shaped how I view history and contemporary politics. Barry taught me to see the complexity of the Middle East and the wide range of ideologies and interests competing over its people and resources. And in learning to see the Middle East through Barry's approach, I came to appreciate the value of the historical model of looking at Islam, Islamism and terrorism. 3. I want to support moderate Muslims as they make the case from within their own religion against the Islamists. For many years I hesitated to stand with moderate Muslims because I feared theirs was a lost cause. The Islamists just seemed to have more money, 80 years or so head start, and a compelling theological case for how the Koran should be read and Shariah implemented. What changed? I don't think those three factors matter very much anymore. I think the new technologies that have already emerged and that will emerge in the coming decades will effectively level the playing field, such that the Muslims whose theology reconciles with modernity will ultimately be able to triumph. They just need to be emotionally encouraged, financially supported, and their future leaders promoted in the media. 4. I have grown more religious in recent years, and feel morally compelled to do this work. I take seriously the concept of "love the sinner, hate the sin" and have now come to regard ideologies as modern day forms of what the Bible labels "idolatry." I am a Judeo-Christian mystic – I believe in the God of the Bible and derive my moral values from both Old and New Testaments, with an emphasis on the prophets and the Book of Job. I've been wrestling with Maimonides' The Guide of the Perplexed the last few years and it shapes my overall approach to religion, philosophy, and by extension my writing and activism. I genuinely believe that we can agree about Western moral and ethical values, while fostering friendly disagreements about theology and culture -- and Maimonides reveals how. Among The Guide's key secrets is this: many of the mysteries of the Bible are revealed by coming to understand the Pagan religions the ancient Israelites were rebelling against. It is necessary and valuable to deeply understand what one's most dangerous enemies believe. It is further vital to understand how they make war against us at multiple levels, including through nonviolent political activism and media manipulation. And the focus of Islamist Watch will be in that spirit – revealing that evil ideologies manifest in our political culture today but can be defeated. The more we understand Islamism as an ideology, and its advocates and fellow travelers operating under the assumptions of 19th and 20th century political organizing, the more we can overcome them with 21st century technology and cross-cultural, multi-faith organizing. 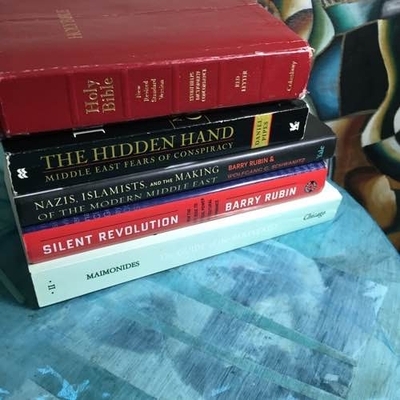 I'm going to start doing more regular blog posts here, both of an evergreen nature on topics related to Islamism and important books to read; and also on immediate, breaking stories about what Islamist activists are doing now. More original stories from the IW watch team, placed at publications around the web. Soon we will begin regular reports on a monthly and then a bi-weekly basis summarizing the most significant activity across Islamist groups. Are you interested in helping us monitor Islamist groups? Would you like to submit articles or blog posts? Get in touch with me via email: Swindle@MEforum.org or on Twitter @DaveSwindle.